Cryptography was used extensively during World War II, with a plethora of code and cipher systems fielded by the nations involved. In addition, the theoretical and practical aspects of cryptanalysis , or codebreaking, was much advanced. Cryptography or cryptology is the practice and study of techniques for secure communication in the presence of third parties called adversaries. More generally, cryptography is about constructing and analyzing protocols that prevent third parties or the public from reading private messages; various aspects in information security such as data confidentiality, data integrity, authentication, and non-repudiation are central to modern cryptography. Modern cryptography exists at the intersection of the disciplines of mathematics, computer science, electrical engineering, communication science, and physics. Applications of cryptography include electronic commerce, chip-based payment cards, digital currencies, computer passwords, and military communications. Cryptography in simple terms means the use of any alphabet or numerical statement which has a meaning or stores a message. Cryptanalysis of the Enigma ciphering system enabled the western Allies in World War II to read substantial amounts of Morse-coded radio communications of the Axis powers that had been enciphered using Enigma machines. This yielded military intelligence which, along with that from other decrypted Axis radio and teleprinter transmissions, was given the codename Ultra. This was considered by western Supreme Allied Commander Dwight D. Eisenhower to have been "decisive" to the Allied victory. Bletchley Park is a nineteenth-century mansion and estate near Milton Keynes in Buckinghamshire, constructed during the years following 1883 for the English financier and politician Sir Herbert Samuel Leon in the Victorian Gothic, Tudor, and Dutch Baroque styles, on the site of older buildings of the same name. It has received latter-day fame as the central site for British codebreakers during World War II, although at the time of their operation this fact was a closely guarded secret. During the Second World War, the estate housed the British Government Code and Cypher School (GC&CS), which regularly penetrated the secret communications of the Axis Powers – most importantly the German Enigma and Lorenz ciphers; among its most notable early personnel the GC&CS team of codebreakers included Alan Turing, Gordon Welchman, Hugh Alexander and Stuart Milner-Barry. A similar break into the most secure Japanese diplomatic cipher, designated Purple by the US Army Signals Intelligence Service, started before the US entered the war. Product from this source was called Magic. In the history of cryptography, "System 97 Typewriter for European Characters" or "Type B Cipher Machine", codenamed Purple by the United States, was a diplomatic cryptographic machine used by the Japanese Foreign Office just before and during World War II. The machine was an electromechanical stepping-switch device using a 6 X 25 substitution table. Magic was an Allied cryptanalysis project during World War II. It involved the United States Army's Signals Intelligence Service (SIS) and the United States Navy's Communication Special Unit. The Central Bureau was one of two Allied Signals intelligence (SIGINT) organisations in the South West Pacific area (SWPA) during World War II. Central Bureau was attached to the Headquarters of the Allied Commander of the South West Pacific area, Douglas MacArthur. Central Bureau's role was to research and decrypt intercepted Imperial Japanese Army traffic and work in close co-operation with other SIGINT centres in the USA, United Kingdom and India. Air activities included both army and navy air forces, as there was no independent Japanese Air Force. Fleet Radio Unit, Melbourne (FRUMEL) was a United States–Australian–British signals intelligence unit, founded in Melbourne, Australia, during World War II. It was one of two major Allied signals intelligence units, called Fleet Radio Units, in the Pacific theatres, the other being FRUPAC, in Hawaii. FRUMEL was a US Navy organisation, reporting directly to CiCPAC in Hawaii and the Chief of Naval Operations in Washington, and hence to the central crypographic organization. The separate Central Bureau in Melbourne was attached to MacArthur's Allied South West Pacific Area command headquarters. Fleet Radio Units (FRU) were the major centers for Allied cryptological and signals intelligence during the Pacific Campaign of World War II. Initially two FRUs were established in the Pacific, one at Pearl Harbor, Hawaii, called Station HYPO or FRUPAC, and the other, called Station CAST or Belconnen, at Cavite Naval Yard, then Corregidor, Philippines. With the fall of the Philippines to Imperial Japanese forces in April and May 1942, CAST personnel were evacuated to a newly established FRU at Melbourne, Australia, called FRUMEL. Fish (cryptography) British codename for high level German teleprinter ciphers. Fish was the UK's GC&CS Bletchley Park codename for any of several German teleprinter stream ciphers used during World War II. Enciphered teleprinter traffic was used between German High Command and Army Group commanders in the field, so its intelligence value (Ultra) was of the highest strategic value to the Allies. This traffic normally passed over landlines, but as German forces extended their geographic reach beyond western Europe, they had to resort to wireless transmission. The Lorenz SZ40, SZ42a and SZ42b were German rotor stream cipher machines used by the German Army during World War II. They were developed by C. Lorenz AG in Berlin. The model name SZ was derived from Schlüssel-Zusatz, meaning cipher attachment. The instruments implemented a Vernam stream cipher. The Short Weather Cipher, also known as the weather short signal book, was a cipher, presented as a codebook, that was used by the radio telegraphists aboard U-boats of the German Navy (Kriegsmarine) during World War II. It was used to condense weather reports into a short 7-letter message, which was enciphered by using the naval Enigma and transmitted by radiomen to intercept stations on shore, where it was deciphered by Enigma and the 7-letter weather report was reconstructed. Japanese army and diplomatic codes. This article is on Japanese army and diplomatic ciphers and codes used up to and during World War II, to supplement the article on Japanese naval codes. The diplomatic codes were significant militarily, particularly those from diplomats in Germany. The vulnerability of Japanese naval codes and ciphers was crucial to the conduct of World War II, and had an important influence on foreign relations between Japan and the west in the years leading up to the war as well. Every Japanese code was eventually broken, and the intelligence gathered made possible such operations as the victorious American ambush of the Japanese Navy at Midway (JN-25b) and the shooting down of Isoroku Yamamoto in Operation Vengeance. 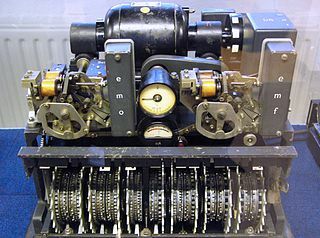 In the history of cryptography, the ECM Mark II was a cipher machine used by the United States for message encryption from World War II until the 1950s. The machine was also known as the SIGABA or Converter M-134 by the Army, or CSP-888/889 by the Navy, and a modified Navy version was termed the CSP-2900. 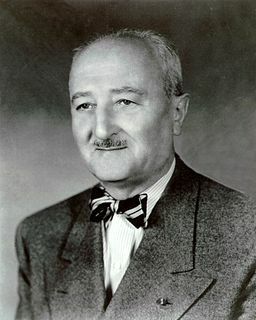 William Frederick Friedman was a US Army cryptographer who ran the research division of the Army's Signal Intelligence Service (SIS) in the 1930s, and parts of its follow-on services into the 1950s. In 1940, subordinates of his led by Frank Rowlett broke Japan's PURPLE cipher, thus disclosing Japanese diplomatic secrets before America's entrance into World War II. Jerzy Witold Różycki was a Polish mathematician and cryptologist who worked at breaking German Enigma-machine ciphers before and during World War II. Henryk Zygalski was a Polish mathematician and cryptologist who worked at breaking German Enigma ciphers before and during World War II. Hans-Thilo Schmidt codenamed Asché or Source D, was a spy who, during the 1930s, sold secrets about the Germans' Enigma machine to the French. The materials he provided facilitated Polish mathematician Marian Rejewski's reconstruction of the wiring in the Enigma's rotors and reflector; thereafter the Poles were able to read a large proportion of Enigma-enciphered traffic. PC Bruno was a Polish/French signals intelligence station near Paris during World War II, from October 1939 until June 1940. Its function was decryption of cipher messages, most notably German messages enciphered on the Enigma machine. PC Bruno worked in close cooperation with Britain's decryption center at Bletchley Park. The Biuro Szyfrów was the interwar Polish General Staff's Second Department's unit charged with SIGINT and both cryptography and cryptanalysis. The bomba, or bomba kryptologiczna, was a special-purpose machine designed about October 1938 by Polish Cipher Bureau cryptologist Marian Rejewski to break German Enigma-machine ciphers. The method of Zygalski sheets was a cryptologic technique used by the Polish Cipher Bureau before and during World War II, and during the war also by British cryptologists at Bletchley Park, to decrypt messages enciphered on German Enigma machines. Alfred Dillwyn "Dilly" Knox, CMG was a British classics scholar and papyrologist at King's College, Cambridge and a codebreaker. As a member of the World War I Room 40 codebreaking unit, he helped decrypt the Zimmermann Telegram which brought the USA into World War I. He joined the GC&CS at the war's end. Enigma is a 2001 espionage thriller film directed by Michael Apted from a screenplay by Tom Stoppard. The script was adapted from the novel Enigma by Robert Harris, about the Enigma codebreakers of Bletchley Park in the Second World War. Antoni Palluth, was a founder of the AVA Radio Company. The company built communications equipment for the Polish military; the work included not only radios but also cryptographic equipment. Palluth was involved with the German section (BS-4) of the Polish General Staff's interbellum Cipher Bureau. He helped teach courses on cryptanalysis, and he was involved with building equipment to break the German Enigma machine. The Lacida was a Polish rotor cipher machine. It was designed and produced before World War II by Poland's Cipher Bureau for prospective wartime use by Polish military higher commands. Major Franciszek Pokorny was a Polish Army officer who, after World War I, headed the Polish General Staff's Cipher Bureau before Major Gwido Langer. Marian Adam Rejewski was a Polish mathematician and cryptologist who reconstructed the Nazi German military Enigma cipher machine sight-unseen in 1932. The cryptologic achievements of Rejewski and colleagues Jerzy Różycki and Henryk Zygalski enabled the British to begin reading German Enigma-encrypted messages at the start of World War II, seven years after Rejewski's original reconstruction of the machine. The intelligence that was gained by the British from Enigma decrypts formed part of what was code-named Ultra and contributed—perhaps decisively—to the defeat of Germany. Ludomir Danilewicz was a Polish engineer and, for some ten years before the outbreak of World War II, one of the four directors of the AVA Radio Company in Warsaw, Poland. AVA designed and built radio equipment for the Polish General Staff's Cipher Bureau, which was responsible for the radio communications of the General Staff's Oddział II. ↑ Budiansky, Stephen (2000). Battle of Wits: The Complete Story of Codebreaking in World War II. Simon and Schuster. ISBN 9780684859323. ↑ Hinsley, F. H.; Stripp, Alan (2001). 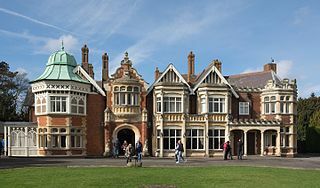 Codebreakers: The Inside Story of Bletchley Park. Oxford University Press. ISBN 9780192801326. ↑ Haufler, Hervie (2014). Codebreakers' Victory: How the Allied Cryptographers Won World War II. Open Road Media. ISBN 9781497622562.